The hardest-working room in the house needs layers of light to do its job. Remember the kitchen with one circular fluorescent tube in the ceiling? Back then, kitchens were places to cook, period, and that fixture was a high-tech way of lighting the cook’s workspace. These days, fluorescent fixtures still provide good light sources, but the kitchen is often part of a larger open space that also includes the breakfast, family and dining rooms. With such a wide assortment of activities and tasks, an area such as this one requires lots of different lighting created by a combination of incandescent, halogen and fluorescent fixtures (photo facing page). In this article, I’ll discuss a number of ideas for lighting a modern kitchen and some things to consider when choosing light sources. Quality of light directly affects your behavior, as anyone who has spent a winter near the Arctic Circle can tell you. Sunlight is the optimal light, but we’ve extended our lives past sundown and have to settle for artificiallight sources.To make the best of the compromise, lighting sources. To make the best of the compromise, lighting designers think in terms of layers of light. Each of the four basic layers (ambient, task, accent and decorative) refers to one type of light in one area of the room; each light is controlled by a single dimmer or switch. 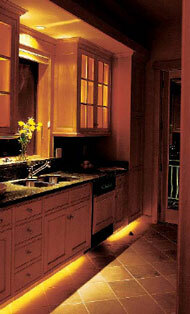 Of the four types, accent lighting is rarely used in a kitchen. Layering light (photos below) gives you the flexibility to create different moods or scenes in the room. For instance, a combination of undercabinet lights, recessed downlights and above-cabinet indirect fixtures creates good bright light for cooking. 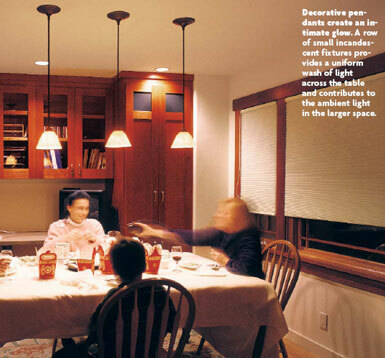 When it’s time to eat, the mood can be shifted from utilitarian to a more intimate setting by turning on indirect fixtures and dimming task lighting. When you plan for layered light, there are some considerations to keep in mind: What do you want to light? What kind of fixtures and dimmers should you use? How reflective are the materials in the space? What sort of trims work better? When planning, it’s a good idea to familiarize yourself first with. Downlights provide good ambient light. Recessed fixtures are relatively glare free and can be used with incandescent or flourescent lamps. Task lighting needs to be bright and shadow-free. Fixtures are mounted toward the cabinets’ fronts to direct light over the work and to reduce glare. Halogen lamps shed good task lighting onto an island or table. Small MR16 lamps in adjustable downlights drive beams of light onto a work surface. 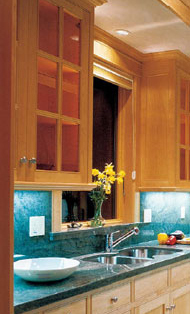 Miniature strips of light mounted in the glass-front upper cabinets make them glow like lanterns (photo below left). Below them, strip halogens or rope lighting hidden above the toe kicks shines a soft light onto the floor. A solitary halogen reflector above the sink, a task light when used with the recessed downlights, becomes an accent light when used by itself. A variety of fixtures (photo right) can change the character of a room and emphasize aspects of an intricate design. Here, recessed downlights with gold trims warm the maple cabinets. Cove lighting (photo below center) makes a good indirect source of ambient light. Controlled by a dimmer, cove lights can also serve as night-lights. The designation Kelvin color temperature describes the warmth or coolness of a light source. Measured in degrees, the scale ranges from 1700°K to 7500°K; the lower the number, the warmer the color. Candlelight, sunsets, incandescent lamps and halogen lamps produce a warm color of light. Noonday sunlight, cool white fluorescent and daylight fluorescent bulbs produce a cool color of light. Residential interiors and skin tones generally look better under a warm color of light. New fluorescent lamps are typically rated in three Kelvin temperatures: 3000°K, 3500°K and 4100°K. The first two are most commonly used in residential lighting. The first job is to provide good general, or ambient, lighting. If you have a limited budget, you can still create good light by installing a 16-in. by 48-in. fluorescent fixture in the center of the ceiling that has color corrected (80 on the color-rendering index, 3000°K) lamps (sidebar p. 73) and a 16-in. by 24 in. fluorescent directly above the sink.You’ll get lots of evenly distributed, natural-looking light. On a larger budget, I like to use downlights recessed into the ceiling. Arranged around the perimeter of the room, downlights can illuminate the fronts of the upper cabinets, a trick that makes the room seem bigger. The light that grazes the cabinet doors highlights the molding profiles and illuminates the inside of the cabinet when you open the door. I start the layout by centering fixtures on the cabinet door or on pairs of doors, about 6 in. to 8 in. from the face frame. When choosing downlight lamps for this application, I prefer a wider beam spread and softer punch of light, so I usually specify 100w halogen A-lamps, which have the widest beam spread available. 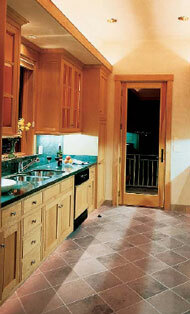 This type of lamp will also throw supplemental task lighting on countertops and help to erase harsh shadows. If I want a narrower, more intense beam of light, I use 75w PAR30 halogen floods. When the ceiling is high (10 ft. or more), I sometimes use recessed downlights to supplement a pendant. This option provides a soft fill light in the space. Once you’ve taken care of the essentials, you can get creative with cove lighting (photo right, facing page). If you have high ceilings, lights above the upper cabinets give a wash of light that’s shadow-free. Cove lighting can be used as ambient light in conjunction with task lights or by itself as a nightlight. You need a minimum of 18 in. between the top of the cabinets and the ceiling. I generally prefer fluorescent lighting here because the lamps have a 20,000-hour life and bounce large amounts of soft light off the ceiling. I center 4-ft. fluorescent tubes end to end on the top of the cabinet to prevent shadowlines between the fixtures from appearing on the wall.To shield the view of the fixtures from below, you must have a 4-in. fascia projecting from the top of the cabinet. Halogen strip lighting can also be used here and has the added attraction of being easily dimmed. 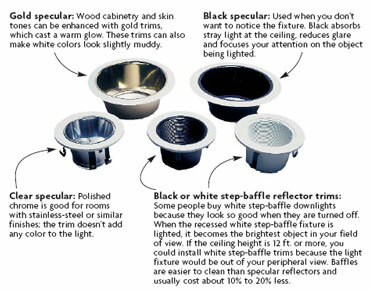 Recessed downlights are available with five basic types of reflectors known as trims. These trims help to direct the light, to reduce excess light at theceiling and to affect the quality of light, so it’s a good idea to think about what you needbefore you spend £15 to £25 for each reflector. You mince garlic, read a cookbook or watch a candy thermometer. When used as task lights, downlights work best positioned over an island or table where their beams can cancel each other’s shadows. In a kitchen with an 8-ft. to 10-ft. ceiling height, I like to use incandescent downlights with small 50w MR16 halogen reflector bulbs or 75w PAR-30 floods on 5-ft. to 6-ft. centers over islands or tables. If I use compact fluorescent lamps, I reduce the interval between fixtures a bit to about 4 ft. to 5 ft. o. c.Over the sink, two similar fixtures spaced 15 in. to 18 in. apart work well. Industry association site that offers design ideas, forums, literature and links to designers and manufacturers. Have you have ever gone to a sports game and noticed the orange lights in the car park? What color is your blue car under one of these lights? Who knows? Your blue car looks gray or brown. This example is a good illustration of the color rendering index, which refers to how realistic colored objects will appear under a given light source. The scale ranges from 0 (the worst) to 100 (the best) and is listed on all fluorescent lamps. Daylight, incandescent and halogen sources render colored objects well and are rated at 100. Cool white fluorescent lamps have a CRI of 64. This rating means that 64% of the objects look normal and 36% don’t look normal under this light source. There are also new fluorescent lamps that now use tricolor phosphor coatings that equally mix blues, greens and reds; the three primary colors make everything look better under these sources. With a CRI in the 70s or 80s, they’re ideal for residential use. Lights spaced every 12 in. to 18 in. o. c. These individual sources aren’t as noticeable as a long continuous strip of fluorescents or halogens. However, they generate higher temperatures. Newer types of xenon halogen lamps made by companies such as Alico and Starfire Lighting supposedly operate at a cooler temperature and have a longer life. Used in conjunction with recessed downlights for task lighting, decorative fixtures add a soft ambience and human scale to the kitchen. 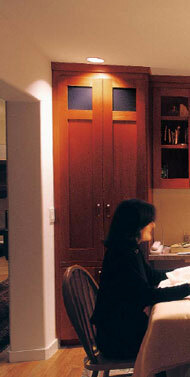 Large-diameter, bowl shaped pendants covered with translucent frosted glass fill a room with light; a line of smaller fixtures is a good option, too (photo above). A hanging fixture should have at least 30 in. of space over a tabletop; over an island or counter where someone is likely to stand and lean, the fixture should hang a bit higher, at least 36 in. to 48 in. from the horizontal surface. The cabinets themselves are another good lighting location. Miniature halogen strip lights or rope lighting can be installed behind a fascia at the base of the cabinets (photo left, p. 70). These 12v circuits (or 24v for longer runs) make great light sources for a change in mood or as night-lights. I don’t recommend this lighting technique if the kitchen has a polished floor; you’ll see the lighting fixture reflected in the finish. These same fixtures look even better inside a glass front cabinet. Hidden behind the face frame, the slim fixtures make the cabinet interiors glow like lanterns, especially effective in low-light conditions. If you have a room full of lights that are controlled by a simple switch, it’s like having a stereo that has no volume control: It’s on and really loud, or off and completely quiet - there’s nothing between. I use lots of dimmers because you can vary the intensities of light according to your mood or the task at hand. As I said earlier, incandescents are easier to dim than fluorescent fixtures. I like a dimmer that all family members can operate and that has a red or green LED night light that locates the dimmer in a dark room. Lutron and Lightolier both make good ones that cost about £25 each. four buttons on the faceplate are programmed to control four different combinations of lighting levels. Programming is simple, and it’s easy to make changes later. Plus, the dimmer is below the button if you want to override the preset. Another application that’s often overlooked is installing a dimmer that controls outdoor deck lighting. This option gives you the ability to get lots of light on the barbecue while you’re cooking and then to lower the level at dinner: no more floodlights while dining under the stars.